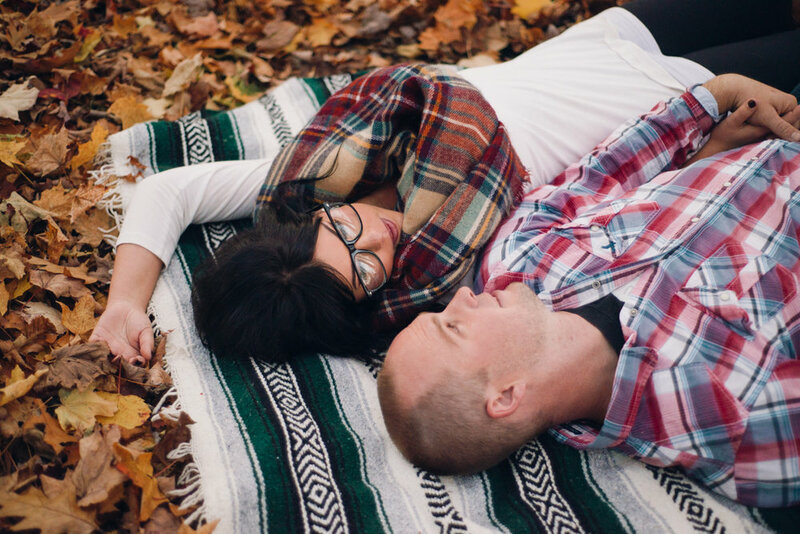 Ryan, Sarah and I were planning a fall engagement session but weather thwarted our plans and we worried that by the time we got to the photo session the leaves would be gone. We were all pleasantly surprised that so late in the season beautiful golden leaves greeted our adventure. We love to spend time with the couples we're going to photograph, and I think when we invited Ryan and Sarah to hike we us we had NO IDEA what we were getting ourselves into it. Thankfully Ryan's lungs surpassed all of ours as he was able to save the day for us to retrieve a bag we left at the bottom of an enormous hill, after we found a beautiful canoe. My hearts desire was to photograph Ryan and Sarah in a canoe on the lake because Ryan loves to fish, but we weren't able to get it ready with the weather. But when we were out on our hike, we looked over a hill and there was a canoe just sitting with two paddles, excited we hiked down and they willingly got in, and i'm so glad because they're some of my favourite images.